Chrysler reported its best December sales in six years to cap a strong comeback year for the industry. The auto industry topped 15 million vehicles in a year for the first time since 2007, and even a disappointing December couldn't tarnish the improvement. General Motors (GM) and Toyota Motor (TM) reported December sales that were down from a year earlier and missed forecasts. But GM's full-year sales were up 7%, and sales to consumers rose 11%. Toyota's full-year sales were also up 7%, and it said it expects sales to continue to rise in 2014. "The auto industry was a consistent bright spot in the economic recovery throughout 2013," said Bill Fay, the head of Toyota's U.S. division. Ford posted a modest rise in December sales that was weaker than forecasts. But that was enough to lift its full-year U.S. sales by 11%. Ford (F) also posted the the largest market share gain of any automakers. Chrysler had its best December in six years, which lifted its full-year sales by 9%. Sales were strong across the industry in 2013, with every major automaker reporting improved sales. U.S. sales reached 15.6 million for the year, up 7.6% from 2012. And although December sales edged up just 0.3% from a year ago, that didn't raise alarms among experts. Michelle Krebs, senior analyst at sales tracker Edmunds, said a couple of factors hit December sales, including bad weather and a strong November that may have moved up some deals that traditionally happen in the last month of the year. 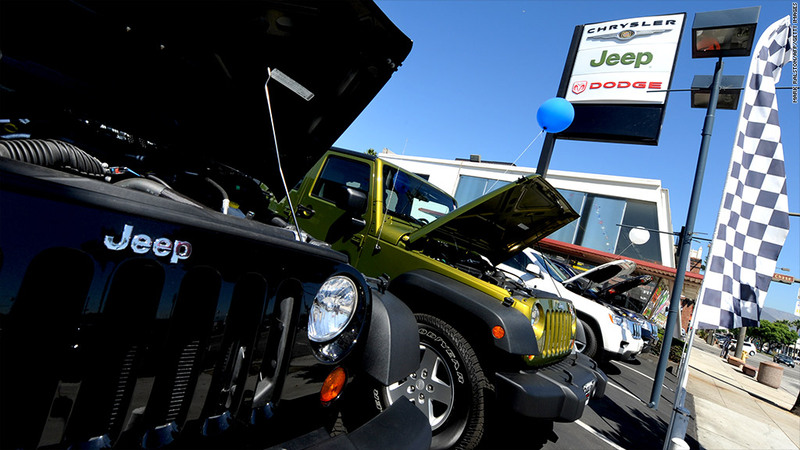 "Dealers and automakers seemed to push Black Friday sales more than ever before," she said. But she is not concerned that the weak December sales are a sign of any problems ahead for 2014. Edmunds and most other forecasters are predicting full-year sales will top 16 million this year. "The fundamentals are getting better and there's a flood of new models coming that should generate excitement," she said. "The new models seemed to do the best in December." The results cap a five-year turn around for the industry, lifting sales a full 50% above the dark days of 2009, when GM and Chrysler tumbled into bankruptcy and required federal bailouts. Today, all the U.S. automakers are profitable, even though U.S. sales are still nearly 2 million vehicles below the record levels of more than a decade ago. Last month, the Treasury Department sold its last shares of GM after their price climbed more than 40% during the year. On Wednesday, Fiat agreed to buy the remaining shares of Chrysler from a union-controlled trust fund. The 2013 sales volume has been much healthier for the industry than the larger volumes of the last decade. There have been more sales to consumers and fewer to rental car companies and other fleet buyers that pay less for cars and quickly dump them in the used car market, pushing down new car prices. As a result, consumers spent a record dollar amount on cars in 2013. Pent-up demand from buyers who had delayed purchases in recent years and were stuck driving older cars. Strong gains in the stock market, which lifted not only household wealth but also consumer confidence. Falling unemployment, which means that more Americans can afford to purchase a car. Greater access to credit, as lenders offered attractive rates on both car loans and leases. A rebound in the housing market, which allowed homeowners to refinance and free up money for a car payment. A jump in home building led to a particularly strong year for pickup truck sales. The auto industry's recovery has been an important driver for the economy as a whole. The industry added about 75,000 jobs in 2013, from auto plants to parts manufacturers and dealerships. More hiring is expected this year. Ford has already said it expects to add 5,000 jobs in 2014, its biggest increase in 50 years. "All the indicators are trending in the right direction," said Alec Gutierrez, senior analyst with Kelley Blue Book. "We see growth continuing, although the pace of growth is going to slow."